It is the time of the year again, which I call "Annual Labelling Exercise" - we have just purchased new books, water bottles, uniform, school shoes and so on for the children to prepare for the next academic year, and we need to put name labels on them! It is timely that the kind folks from StickerKid offered to send some personalised name labels for the children. Manufactured in Switzerland, Stickerkid uses high quality material to produce the best possible stickers. 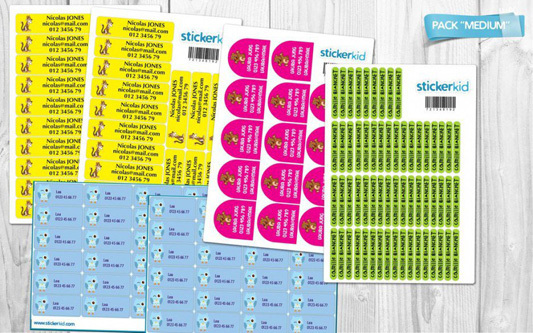 Stickerkid carries a range of products - stickers for belongings (with different sizes and shapes), stickers for clothes and shoes, identification bracelets and so on. We can customise the stickers by ourselves - the colour of sticker, colour and type of text, and the logo! The online ordering system is so easy to use! It took about 1 week+ to receive our stickers, which were shipped from Switzerland. The colour of the stickers is vibrant and the texture is glossy! They are easy to peel from the sticker sheet. 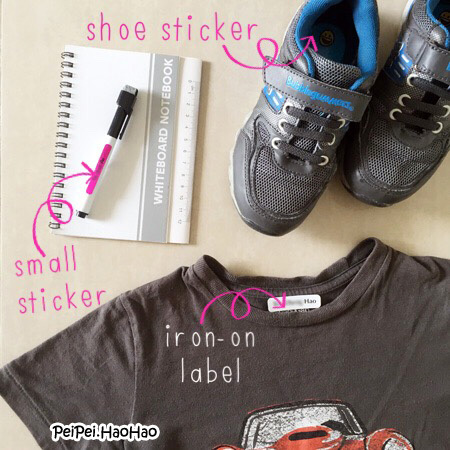 The name stickers and shoe labels are waterproof, so no worries to use them on water bottles and shoes! The iron-on clothing labels that we received are removable type, just use a very hot iron and they can be removed! 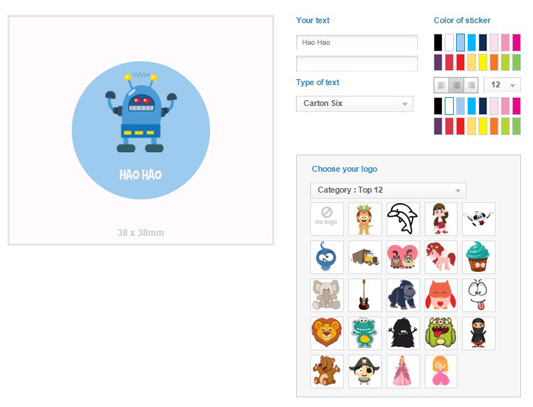 StickerKid has kindly offered 10% discount code on the products for all PeiPei.HaoHao readers! 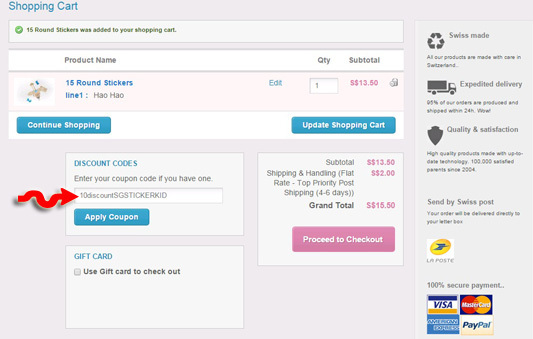 Enter the discount code 10discountSGSTICKERKID in the Shopping Cart, and click "Apply Coupon"! The discount code is valid until 31 December 2015. The discount is applicable on the products only, it is not applicable to the shipping cost of SGD2. Disclaimer: We received 2 sets of stickers for review purpose. No monetary compensation was received. All opinions and photos are mine, unless stated otherwise.